When the Federal Reserve's Open Market Committee (FOMC) meets in the coming week, there will be pressure from various quarters to raise the federal funds rate. Jamie Dimon, chairman of JP Morgan, has stated blankly “Let’s just raise rates." Furthermore, he has said a quarter point is just a “drop in the bucket." We know where the big money banks stand on the issue. 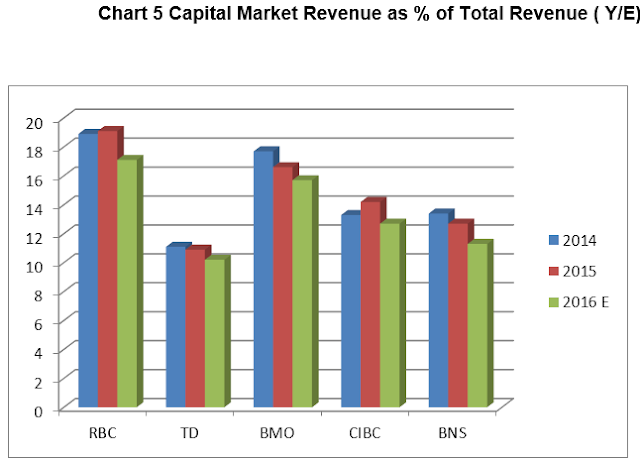 They need higher rates to achieve better profit margins. But even from other financial quarters, there are calls for the Fed to stop speaking and start acting. Many point to that fact that the labour markets have recovered very well from the 2008 crash and that the economy is hovering around full employment. 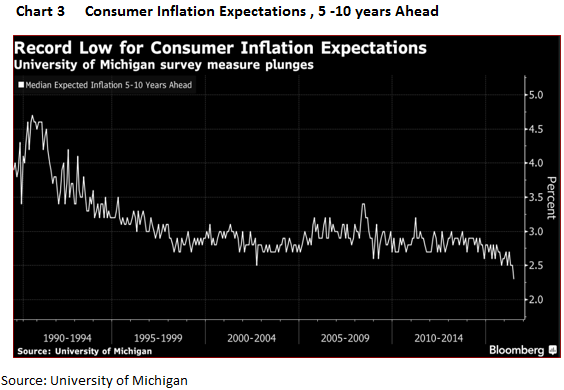 Although the Fed's inflation target has not yet been reached, there are many who warn that the real risk now lies in getting behind the curve. Once the inflation genie is out of the bottle, they argue, it will be too hard or, at least painful, to put back. So, why is that the Fed so reticent to start a real move towards ‘normalizing’ credit conditions? In a speech last week, Fed Governor Lael Brainard offered an insight into this question (1). 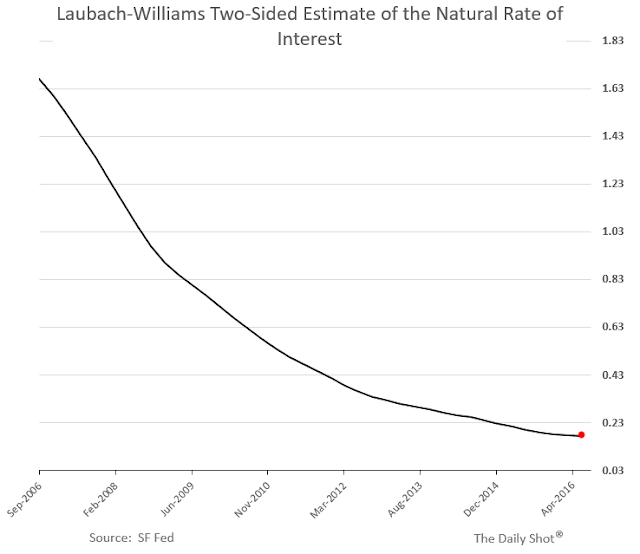 The clue to her thinking lies in the analysis of the "neutral rate of interest." This rate is defined as the '' level that is consistent with output growing close to its potential and with full employment and stable inflation". In other words, it is an ideal condition when the economy is using all its resources to the fullest and inflation remains constant. If the fed funds rate is below the neutral rate, then monetary policy is promoting expansion; a fed funds rate above the neutral rate implies a tightening of monetary conditions. But here is the rub. The “neutral rate” cannot be observed. We have to back out the number by observing the behaviour of the major components of the economy; we need to look at output and employment as it is and then judge whether what we observe are, in fact, the conditions that give rise to the neutral rate. It is a judgment call, and with all such calls, one can be second-guessed. Governor Brainard argues, on two related grounds, for waiting longer before raising the federal funds rate: 1) that the current fed funds rate is consistent with the current neutral rate, and 2) the neutral rate today is much lower than the rate in previous decades. In other words, this time, it is different. ( see accompanying chart). It is this second point that bears scrutiny. There has been a downward shift in the neutral rate. Hence, we are in what is now referred to as the “ new normal”. There is a lot to be said in support of this view. During the Great Recession, starting in 2008, nominal interest rates have been zero in the US (and negative in the EU and Japan). All the while, growth has been subdued (less than 2 per cent) and inflation very stable (about 1.5 per cent). Put differently; the US economy continues to expand modestly with the nominal rate at zero and the real rate negative. This has not happened anytime in the post-war era. The Pace of Future Rate Increases. Turning to the future, Brainard points out that the Blue Chip consensus anticipates that the longer-run federal funds rate will be 1.1 per cent over the next decade. This is about 1 per cent lower than the pre-crisis average. It now appears that the FOMC has adopted a similar outlook. In January 2012, the Fed projected a long run average federal funds rate of 2.25 per cent. Now, its most recent projection is for a rate of 1.5 per cent -- a significant 75 basis points (bps) downward revision. The Fed is recognizing that the “new normal“ features a much lower funds rate, a much lower neutral rate and hence there is no urgency to raise rates. Given this outlook, what can be inferred about the pace of future rate increases? After all, if the new normal features a lower neutral rate and accompanying slower growth and subdued inflation, then what will be the path for future rate changes in pursuit of ‘normalization’? But seven years into the expansion and with little sign of a significant acceleration in activity, the low neutral rate looks likely to persist. Indeed, developments over the past year confirm that the underlying causes will be with us for some time. Foreign consumption and investment are weak, while foreign demand for savings is high, along with an elevated demand for safe assets. Productivity growth, which increased at an average annual rate of nearly 2-1/2 percent from 1950 to 2000, has increased only 1/2 percent on average over the past five years, and demographics also suggest a persistent slowing of the labor force. This is a long list of what ails economies everywhere. Simply put, all the weak conditions that are present today are expected to continue in the future. If the current conditions justify near zero-bound interest rates, then we can expect near zero-bound rates for a considerable time. At best, those who want the Fed to move faster will have to be content with ‘baby steps’. With the awaited decision of August 4, even the Bank of England has put aside any delay and has steered towards an aggressive expansionary monetary policy to contrast the recessionary pressures due to the Brexit shock on market expectations. Apart from the expected interest rate cut of 25 basis points, different unconventional measures stand out: a 6-months resumption of the government bonds (Gilts) buying programme for a monthly amount of $ 60 billion, to be combined in synergy with the purchase of £ 10 billion of corporate bonds in 18 months. The intervention in the corporate debt markets remains one of the most incisive tools in the hands of the central banks in order to induce a reduction in the funding costs of the non-financial sector and bypass the credit crunch due to a distressed banking system. At the state of the art, corporate bonds purchase programs are active in Japan, UK and in the Eurozone. On many occasions the Bank of japan has accelerated the pace of the purchases, even if now it appears it has reached its limits of intervention: the size of the market is not ample enough to support further expansions of the program, while the big Japanese industrial corporations are able to finance themselves at near zero interest rates (recently Toyota succeeded in placing a 3-years bond by offering a yield of 0.001%). In Europe the program is instead in its infancy; at the present state, the room to maneuver is ample. The ECB has started the purchase operations of corporate bonds in June 2016 and only now the first stream of official data has begun to be released; few numbers that however are enough to verify if the first estimates made when the program was launched in March 2016, were at least realistic. According to the numbers published by the ECB, the 93% of the overall € 13.2 billion of purchases has been made on the secondary market, while only the 7% (that corresponds to € 1.16 billion) during the placement of new issues. This is not a negligible amount if we consider the traditional reluctance of the ECB to intervene in primary markets (the Quantitative Easing on government bonds is focused exclusively on the secondary market). From our point of view, this behavior signals a relative scarcity of eligible securities on the secondary market to sustain the planned pace of the ECB purchases. On the basis of the experience of the Quantitative Easing, we estimated an overall pool of corporate eligible assets of € 550 billion and a monthly purchase ranging from a minimum of € 3 billion to a maximum of € 6 billion, without however taking in account the possible response of the market. In fact, in the hopes of the ECB, the non-financial sector should have increased the issues of debt to take advantage of the launch of the program. In this perspective, the historical records were not so favorable, since they showed a downward trend of the market issues (both gross and net of reimbursements), with a decline that was accelerating in the last months of 2015. In August 2016, we have to acknowledge that the real data of monthly purchases (€ 6.6 billion) lie outside the estimated range, but only for a small amount. 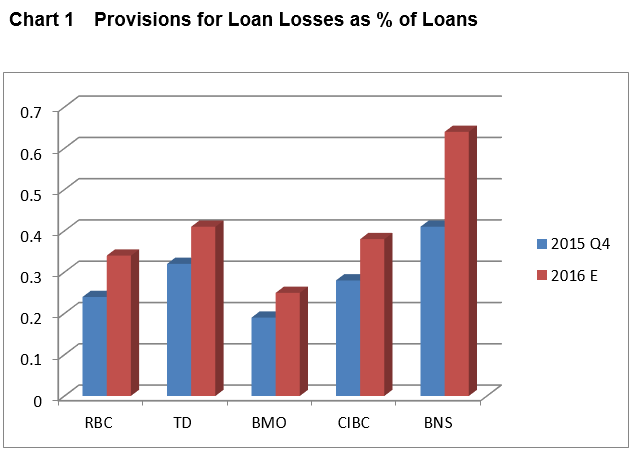 Therefore it’s interesting to check if an “announcement effect” of the CBPP program has effectively pushed the non-financial sector to issue more debt. 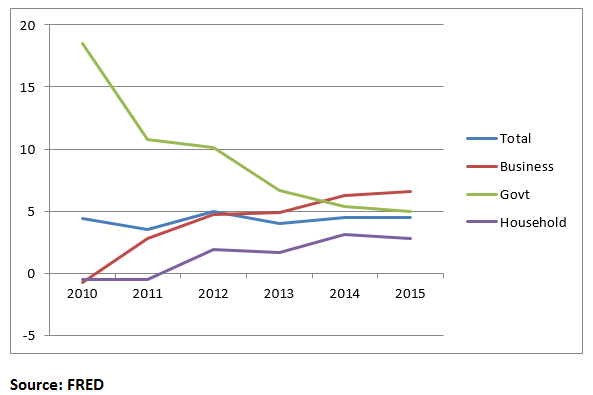 To this purpose, let’s observe carefully the following bar charts that represent the historical trend of gross and net issues of Euro-denominated bonds of Euro-Area non-financial corporations. One can easily notice that starting with the month of March 2016, the big European corporations have increased considerably the issues (from € 30 billion to € 70 billion for what regards the monthly gross issues, from 0 to 20 in net terms). Hence, the good response of the market in the last four months and the consequently augmented availability of eligible assets could reasonably explain the dynamics above expectations of the ECB purchases. The ECB is clearly aiming at having a positive, durable impact on the financing costs of the non-financial sector, to be achieved through a compression of bonds yields. In fact, the presence of the ECB as a buyer of last resort should provide to the corporations a stable, implied guarantee of a successful placement, a necessary condition to obtain lower yields. Even in this case, we have been able to retrieve useful empirical data to clarify the impact of the “announcement-effect” first and then of the purchases on the yields' dynamics (see Figure 3). In Figure 3, the historical trend of the Bank of America Nonfinancial Index from January to August 2016 is analyzed. The index is representative of the average yields non-financial Euro denominated investment grade corporate debt publicly issued in the Euro member domestic market. The observed pattern of the index shows a marked decline after the launch of the program by President Draghi in March 2016, a subsequent stasis and a relapse in the downward trend in conjunction with the start of the ECB purchases on the primary and secondary markets. Overall it could be observed a reduction in the BofA index (that as said before should roughly correspond to a weighted average of yields of Euro-denominated corporate bonds) up to 90 basis points from the relative maximum registered at the beginning of 2016. In summary, the first empirical evidence seems to confirm the potentiality of the ECB corporate bonds purchase programme in contrast to the credit crunch, at least in average at a European level. The data seem to highlight a significant responsivity of the new debt issues and of the average yields to the ECB monetary stimulus, which intensity appears to exceed the prudential expectations of the market. However, in the future months, it should be observed if the central bank will be able to continue the purchases at this sustained pace without impacting the market liquidity that remains very thin. Moreover, it’s not granted that lower funding cost for the non-financial sector will stimulate new investments. On the issue, numerous doubts are still in place: in Japan, the big corporations have used the new liquidity trickling from the monetary authorities to the banking and corporate sector to benefit the existing shareholders, both directly by boosting the dividends and indirectly via buybacks. 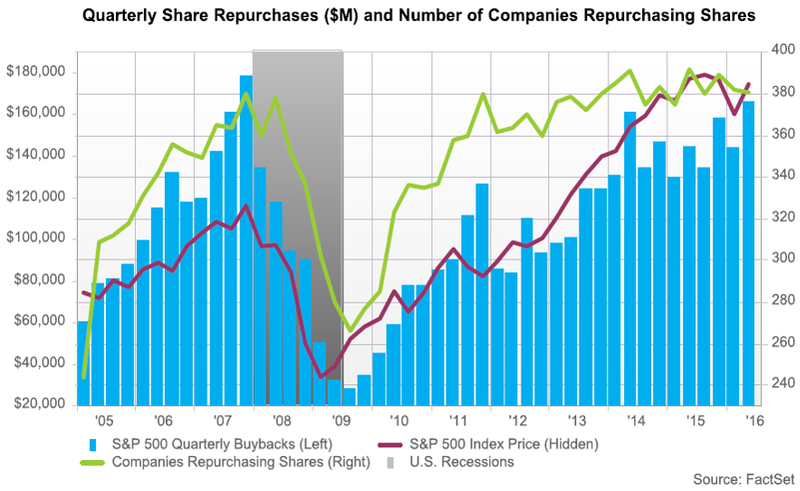 The buybacks have exploded from ¥ 1000 billion in 2012 to over ¥ 4000 billion in 2015, but visible effects have been appreciated only on the stock markets, where the ETF and corporate bonds purchases have been determinant in sustaining the Nikkei index to high levels. The dynamics of corporate investment have been largely unaffected by the BoJ unconventional measures. Paradoxically, the market rewarded these strategies since a reduction of the floating stocks increases by definition the earning per share. Time will tell. Surely, the small businesses, cut off by Draghi’s CBPP, will continue to endure a persistent credit crunch due to the difficulties of the Eurozone banking system, especially in peripheral countries. This is not exactly encouraging from the perspective of growth in countries where the small-medium enterprises are the core of the manufacturing sector, like Italy. When two of the biggest US pension funds reported very disappointing financial results this month, it became apparent that the pension industry needs a reality check. For the past fiscal year the California Public Employees’ Retirement System earned a merger return of 0.6 percent on its investments; the California State Teachers' Retirement System did only marginal better, clocking an investment return of 1.4 percent. 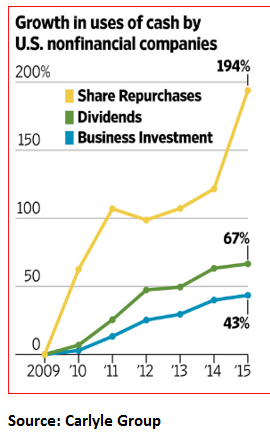 Both funds had a target rate of return 7.5 percent . To be fair, one year`s result does not make a trend, but the results were so far below target as to warrant an examination of the new world confronting pension fund managers. 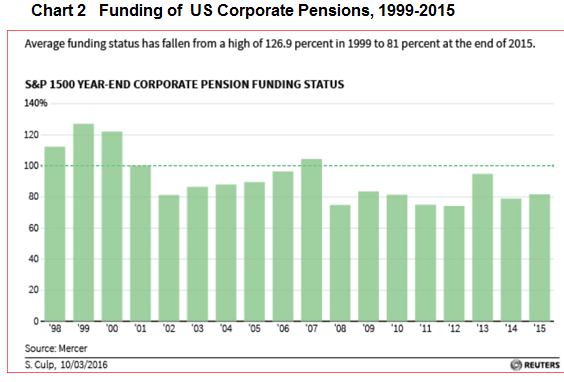 We begin by taking the measure of how far public pension funds (Chart 1) and corporate pension funds (Chart 2) are underfunded. Underfunding is a moving target over time and is reflective of several moving parts, such as : shifts in demographics (an aging population); estimates of longevity of retirees; economic performance (slow growth means lower contributions); and rates of return on various asset classes. In the US, both public and private pensions have experienced a steady erosion in funding status over the past decade and a half. The large public pension plans and large corporations only support 75-80 percent of liabilities today. 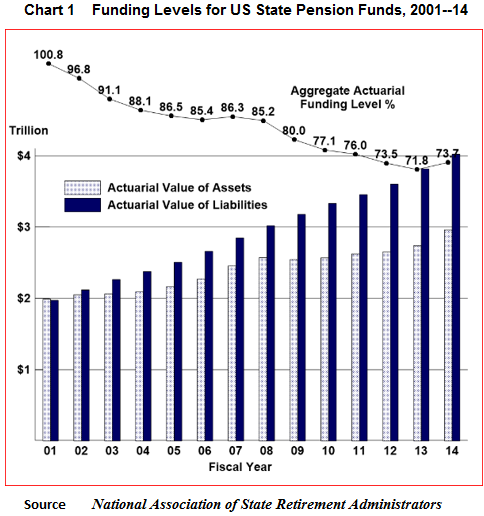 The underfunding exists despite a very good rate of growth in total assets under management; however, liabilities have increased faster and one reason for this can be traced to the dramatic fall in long term interest, especially, post 2008. Overall rates of return earned in the pension industry throughout the developed world have steadily fallen, resulting in a relative weak performance in asset accumulation .A recent OECD study measured the rates of return over 5- year and a 10 -year periods. (Chart 3). 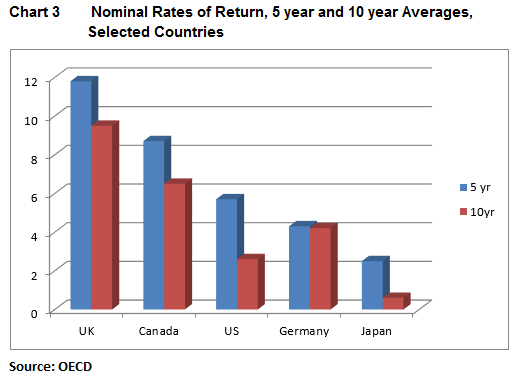 Nominally, the US (3 percent) has underperformed its peer group in the UK (9 percent) and Canada (6 percent); all countries have experienced weak results over a 10- year period. These relatively low rates of return are at the heart of the issue facing the industry: namely, are the targets set too high? What does it take to earn 7.5% ? 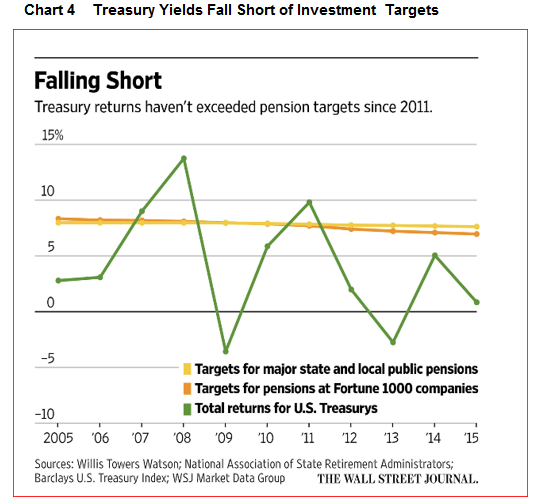 The vast majority of the US pension industry clings to investment targets of 7-8 percent annually. True, this is an expectation over an average of 5 years as the industry must live in a world of high volatility. Yet, how realistic is this target? Lets look it at from a macroeconomic perspective. A nominal return of 7.5 percent implies that national income --- wages, profits-- should, on average, grow at 7.5 percent. That is, the national income growth should be about 5 percent real growth plus 2.5 percent inflation. Neither that real growth rate or that inflation rate has been achieved on a sustained basis over the past decade. Moreover, mainstream economists do not anticipate that the US economy will achieve real growth rates of 5 percent in the coming years; continued moderate real growth of 2-3 percent is anticipated ; and inflation expectations remain very subdued, as evidenced by the low long term interest rates. So, from a macro perspective, the 7.5 percent target is hard to justify. The industry needs to generate rates of return well in excess of the economy`s capacity to create income growth. Considering the target from a microeconomic perspective, the target seems even more illusive. 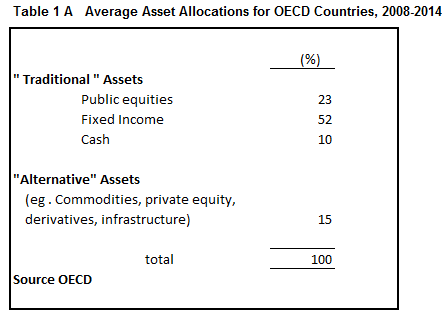 Table 1A presents the findings of the OECD study on the composition of assets in the majority of large pension funds. The funds continue to rely on the "traditional" assets of government and high quality corporate bonds (50-55 percent) and publicly traded equities (20-25 percent) of all pension fund assets. In recent years, the funds sought to enhance yields--- the so-called 'search for yield'-- by investing in commodities, private equity funds, hedge funds. commercial real estate and large infrastructure projects. 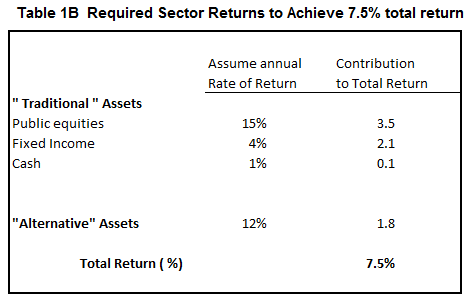 These " alternative " assets account for about 12-15 percent of total assets under management. 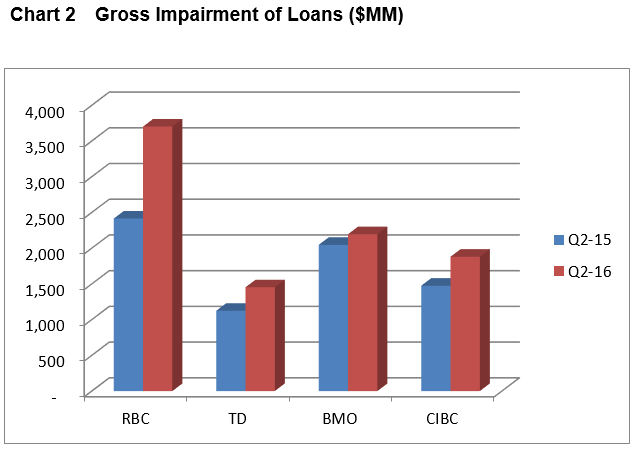 However, these alternative investments can and have been very volatile, e.g. 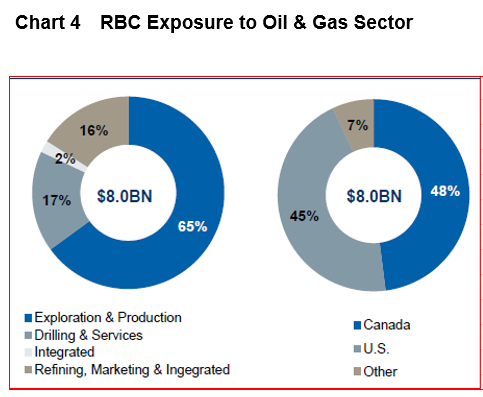 commodities, and some of the large funds have dropped that category from their investment basket. Table 1B considers what the growth rates of the various asset classes needs to be in order to generate an overall growth rate of 7.5 percent. Clearly, all asset classes must grow at quite high rates in order to reach the overall target. Equities need to average a growth rate of 15 percent annually, bonds need to return 4 percent a year, and more importantly alternative asset classes have to clock in at rates of 12 percent a year to help achieve the overall investment target. The most important asset class--- US Treasuries-- has suffered the most as illustrated in Chart 4. As yields in Treasury yields continue to fall since 2011, the spread between Treasuries and target returns has widen. This puts additional pressure on fund managers to seek higher yields in the non-traditional asset groups, especially in commodities and hedge fund activities-- both of which are very volatile and risky. All the while, the funds cannot run afoul of the regulatory authorities who have to safeguard current and future retirees` income. Pension fund managers are caught between a rock and hard place . Many US state plans are forced to meet the underfunding issue by increasingly relying on tax receipts to top up funds at the expense of other basic state obligations such as public education. With each passing year, the shortfalls increase, yet the state needs for other obligations continue to climb. Thus the short falls come at a considerable cost to the nation. Some public funds, such as the Canadian Pension Plan, have invested in long term infrastructure projects at home and abroad as a means of boosting returns. Such opportunities are far and few between. In the US, many pension plans have invested in hedge funds and a variety of financial derivatives as a way to overcome low yields from traditional assets. Nonetheless, this search for yield does not move the needle sufficiently to allow the pension funds to meet their targets. By no means is this situation confined to the US. The British pension industry has been underfunded for sometime, and the situation became a whole lot worse following the Brexit vote. 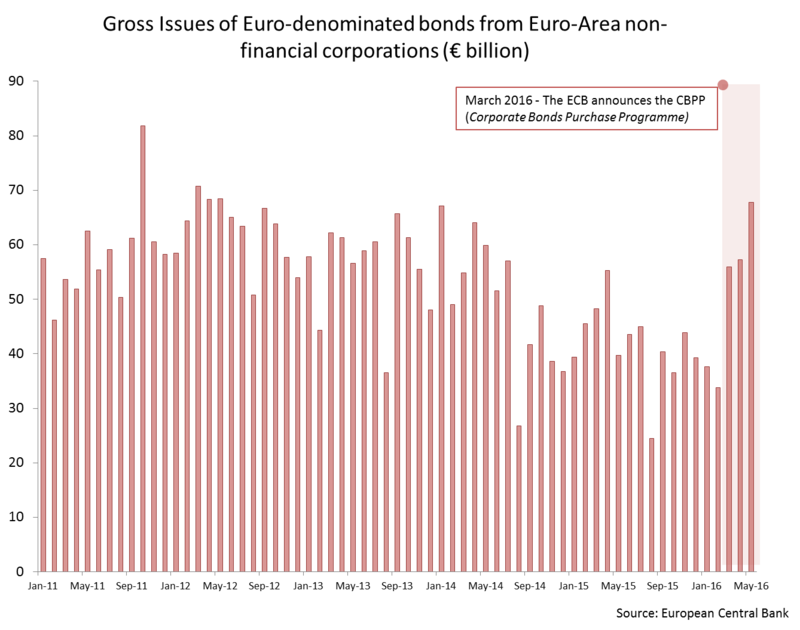 UK interest rates fell significantly since the June vote, applying more pressure on managers to correct underfunding. Finally, the wave of negative interest rates in Germany and other EU countries have made pension managers` lives a lot more difficult in their search for positive- returning assets. Implicit in this report is the recognition that slow global income growth and low interest rates will dominate the international community and historic investment targets are not expected to be repeated. Thus, we can anticipate a number of changes in the industry, including: the demise of the defined benefit program; younger members having to pony up more in pension contributions; taxpayers topping up state plans; a continual re-assessment of longevity risks; and an downward adjustment to overall investment targets. These changes amount to a significant adjustment to the parameters that guide pension funds going forward. Ever since the 2008 financial crisis, there has been a persistent shortage of high-quality government debt. More than just a safe haven in times of financial stress--- the so-called 'flight to quality' -- the supply of high- quality sovereign debt has been steadily shrinking. This shortage became acutely apparent with the results of the Brexit referendum as investors worldwide bid up bond prices to the point where most long term bond yields reached historic lows in the US, UK , Germany and Japan. Brexit only exacerbated a shortage problem that bond investors have had to contend with for nearly a decade. The current squeeze in supply is just the latest manifestation of this wider issue in today's financial markets. To claim that there is a shortage of government debt must seem counter-intuitive to many readers. After all, there is no end of studies demonstrating that major economies have record high government debt-to- GDP ratios, signifying that there is too much debt, not too little. Many critics call for governments everywhere to issue less debt, arguing that such high levels of debt ratios contribute to sluggish growth, if not, outright stagnation. European governments continue to exercise spending restraints and, in general, austerity is the byword throughout the industrialized world. Governments have been very reluctant to open up their coffers by issuing more debt to fund expenditures. But scarcity is not about supply alone. In the wake of the financial crisis, households and businesses are demanding more safe assets to protect themselves against sudden downturns. Similarly, regulators are requiring banks to hold more safe assets. Market prices tell us that the government needs to produce more safety in order to meet this increased demand. ........ The inadequate provision of safe assets also has profound implications for financial stability. Without enough Treasury bonds to go around, investors “reach for yield” by buying apparently safe securities from the private sector ...if such behavior becomes widespread, it can create systemic risks that tip the financial system into crisis. To better understand how bonds became scarcer, we begin by looking at who is buying government debt and why. As the Federal Reserve sought ways to stimulate the economy, it became the first major central bank to start a bond-purchase program-- Quantitative Easing (QE) Soon after the Bank of England (BoE) , the Bank of Japan (BoJ) and most recently the European Central Bank (ECB) developed their own versions of QE. ( Chart 1). The US Fed holds nearly 20 percent of all Federal government debt; the BoJ owns over 30 percent ; the BoE, 25 percent; and, the ECB has so far bought about 15 percent of German debt. The Fed is no longer purchasing debt, while the other central banks continue with their QE programs. The Fed increased its balance sheet dramatically from about $800 billion to over $2.4 trillion under three QE programs . Although the Fed no longer actively purchases government bonds, it appears in no hurry to release those bonds into the marketplace, instead allowing the bonds to mature fully over time. Over 40 percent of outstanding US Treasuries are held by foreign central banks , sovereign wealth funds and other institutions. China and Japan together account for about 12 percent. As the US runs current account deficits with its major trading partners, the excess in US dollars are re-cycled into purchases of US Treasuries. More importantly, many central banks , especially, those in emerging countries have purchased Treasuries in increasing amounts and holding them to shore up their balance sheets and to provide needed foreign exchange reserves. In sum, Treasuries are been soaked up by US domestic and foreign entities as part of a worldwide push to strengthen balances in the private and public sectors in the wake of the 2008 financial crisis. The ECB and the BoJ both continue with very aggressive bond purchasing programs. The BoE may be forced to expand its current program in response to the fallout from UK voters opting to leave the EU. The ECB came late to the game of bond purchases, starting in 2015, some six years after the US first implemented QE. Initially, the ECB embarked on a program of purchasing government debt at a rate of 50 billion euros per month. But as the supply of qualified government debt diminished the ECB increased its bond purchasing program to included corporates . Overall, the ECB program now soaks up about 80 billion euros a month of high quality debt . Speculation is ripe that the ECB will do more bond purchasing in the wake of the Brexit vote. 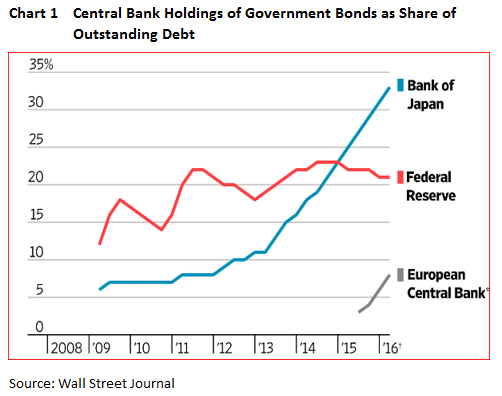 Turning to Japan, the BoJ has long been a huge purchaser of domestic government bonds( JGBs) .Over the next four years, the BoJ is expected to own over 60 percent of all outstanding JGBs, the highest of any country. 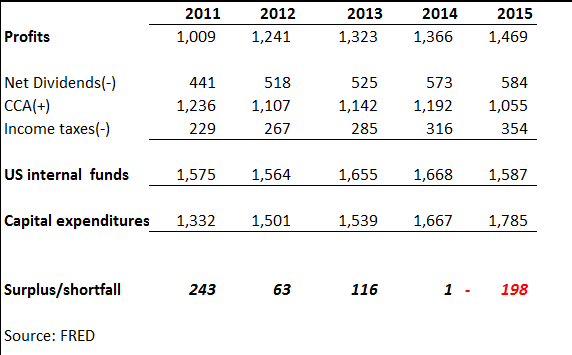 Domestically, major holders of Treasuries include Federal government and state / local pension plans ( Table 1). These plans will require additional risk-free Treasuries to meet longer term obligations. US charted banks have significantly increased their holdings of Treasuries and Agency debt as a means of strengthening their balance sheets. From 2013 to the present , commercial banks increased holdings of Treasuries by 30 percent .Finally, private pension funds and the life insurance companies hold approximately 6 percent of their assets in Treasuries. Industry analysts argue that proportion is inadequate to meet future liabilities and it is expected that these institutions need to double their holdings to satisfy future income requirements. In short, government bonds will be a strong asset class from here on out as these institutions re-balance their portfolios to meet long run requirements. Not surprisingly, central banks themselves are having trouble finding all the bonds they need. For example ,the ECB is not permitted to buy bonds with a yield lower than its deposit rate of minus 0.4 percent, thus excluding many billions of euro-dominated bonds issued by Switzerland, Germany, France , Netherlands and Sweden. In other words, there is a real squeeze on positive-yielding safe haven bonds. Since the emergence of the debt crisis in Europe starting in 2012, there has been a wave of national debt downgrades .The Bank of America Merrill Lynch estimates that the share of bonds with the three highest credit ratings has dropped to 51percent of all debt tracked by the bank’s world sovereign bond index from 84 percent in 2011. With so many institutions restricted from purchasing anything less than high quality bonds, managers are facing a smaller and smaller market in which to participate. 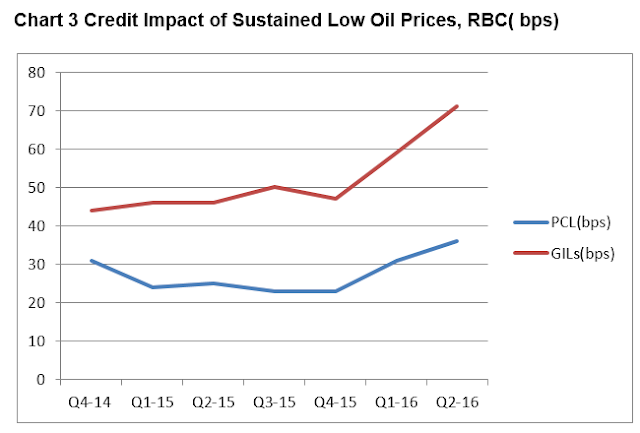 Credit worthiness comes into play in the very large repo loan market where high quality debt is used as short term collateral by hedge funds, money markets, private equity and other lending groups. It is estimated that the volume of repo loans using Treasury debt has nearly halved since the financial crisis of 2008. On the issue of liquidity, there have been system wide reductions, even in the case of the US Treasury market, considered to the most liquid of all bond markets. Regulatory changes post-2008 have made bond dealers less willing to hold inventory and facilitate trades. 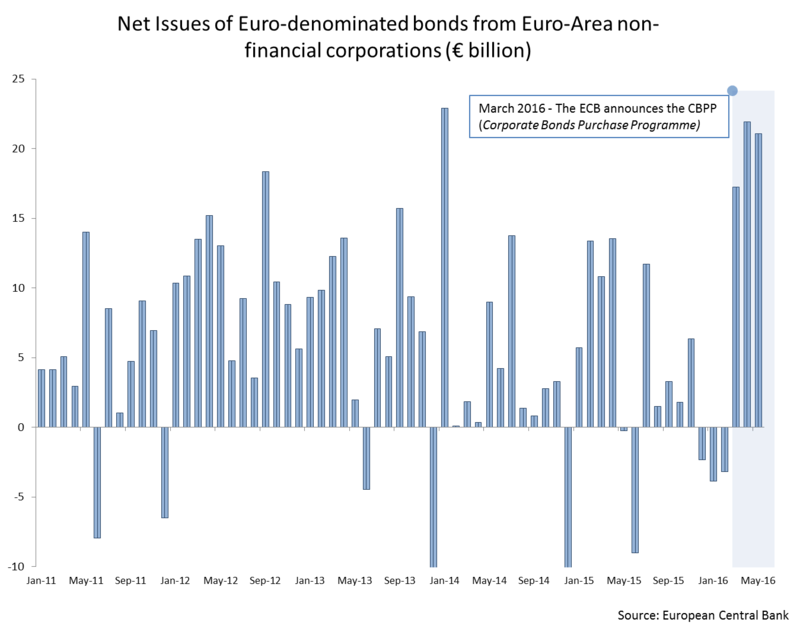 Bond trading desks have slashed inventories in response to regulations such as Basel III and the Volcker Rule. Hence, primary dealers have reduced their U.S. debt holdings by as much as 80 percent according to Bloomberg. com estimates. These liquidity developments have prompted Barry Eichengreen of UC Berkeley to argue that ``international liquidity has plummeted from nearly 60 percent of global GDP in 2009 to barely 30 percent today.`. Recent auctions for US Treasuries feature large oversubscriptions, and this has driven yields lower. There is more than just a temporary flight to safety to quality debt; there appears to be a major shift in asset preference in favour of high-quality debt issued by the US and other major countries at a time when the supply of that debt is not keeping with demand. In a recent report , Bank of America Merrill Lynch said that "the world is running out of positive-yielding safe-haven bonds’’. 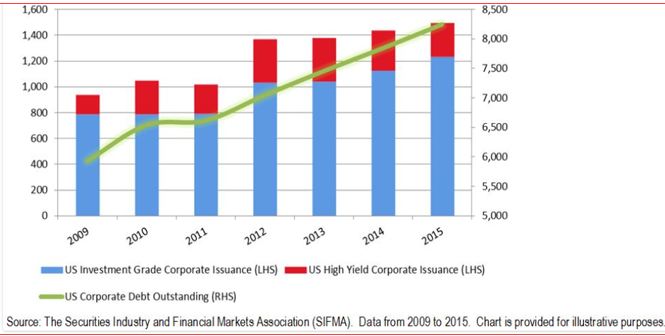 The looming shortage has implications in many segments of the fixed income market. Every indication points to a worsening of the supply shortage of high quality bonds. In the US, the 2016 Federal deficit is expected to be lower than the previous year by some 25 percent. To finance this lower deficit, the Treasury has opted to issue more bills instead of bonds as a means of lowering interest costs .This combination will exacerbate the shortage situation and will most likely keep long rates down at these current levels. In Europe, the ECB is running out of qualified government bonds to purchase in the wake of a growing segment of the market having gone deep into negative territory. 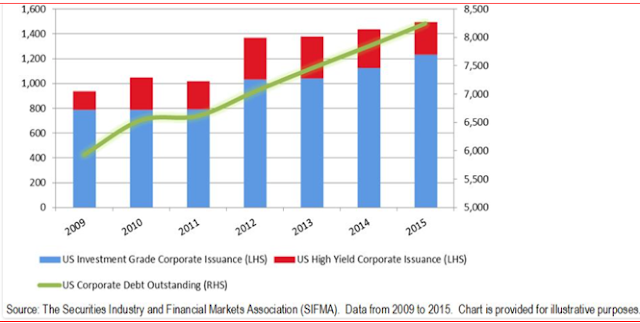 It has had to resort to buying corporate bonds to satisfy its purchasing objectives. There is no sign that Euroland will ease up on its austerity program and we can expect a tight supply of new government issuance in 2016-17. Japan continues to wallow in deflation and the BoJ is continues to be under pressure to step up its bond purchasing program, driving longer dated yields ever lower. From a supply perspective alone, we can expect that long term rates will be kept at these historic low levels. Over the past month, the global bond markets have been sending out signals that all is not well with the global economies. Initially, the surge in negative nominal rates in Europe and Japan rattled many investors in both the fixed income and equities markets. This historic development suggests that large-scale investors are anticipating low growth and disinflation for many more years. 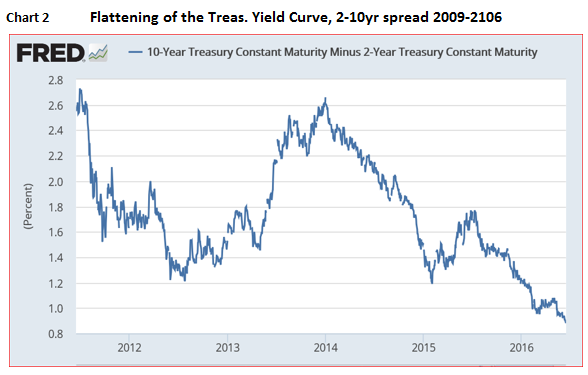 Simultaneously, the yield curve, especially in the US, has been flattening, again signalling that growth is slowing, giving the policy makers considerable pause in their deliberations on the course of future interest rates. This blog examines both these developments to help the reader understand the signals coming out of the bond markets around the world. 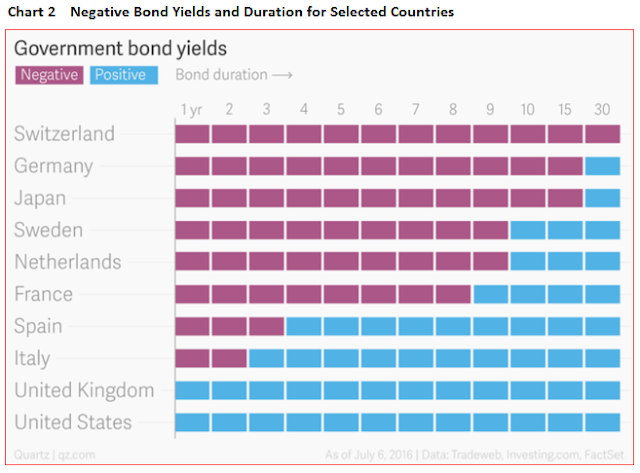 For more than a year, short to medium term rates of interest in many countries have landed in negative territory. The ECB instituted negative overnight lending rates in an effort to discourage commercial banks from depositing excess reserves with the ECB; instead, these such funds should be made available to their borrowers in the hope of stimulating loan demand throughout the region. More recently, the ECB started to buy, initially, longer dated sovereign debt from member countries in the expectation that long-term rates would fall to stimulate investment growth. Now, the ECB has expanded this quantitative easing program to include investment grade corporate bonds. Purchases of both types of debt exceed 80 billion euros a month, as the ECB pulls out all stops in pursuing its goal of re-inflating the EU economies. The result of this combined effort is shown in Table 1 which reveals that major European countries and Japan now live under a regime of negative long-term rates. Of more significance is the measure of real rates of interest--- nominal rates minus the rate of inflation. In some countries, real rates have turned negative ( e.g. 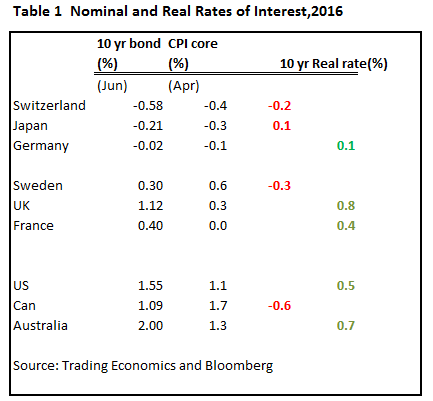 Japan, Switzerland, and Canada) and in other countries, the real rates are barely in positive territory ( e.g. Germany and France). The key takeaway from Table 1 is that the industrialized nations now offer 10-year bonds at real rates that are less than 1 percent, well below the long term historic rate of 2 percent. The yield curve represents what investors are willing to accept by holding debt over short, intermediate and long-term periods. A typical yield curve is sloping upwards since longer term investors normally require a greater return to compensate for the risks of holding debt over many years. The extra return - referred to as the term premium - reflects the investor's view of future economic growth and inflation among other considerations. 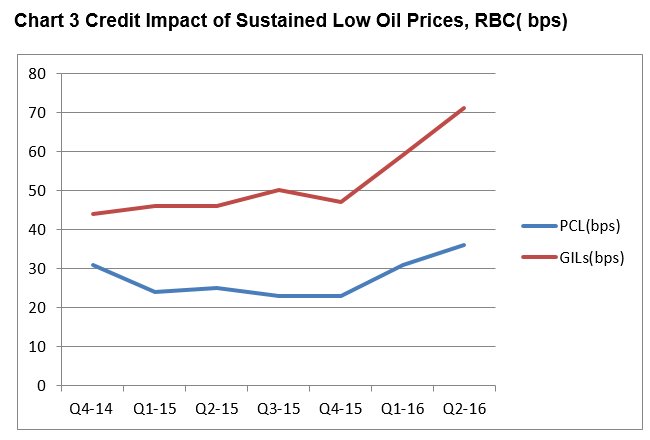 A rising term premium reflects concerns over excess supply of debt, credit quality, and higher inflation in the future; a falling term premium has these factors moving in the other direction. Over the past year or more, the term premium has fallen significantly, hence the fall in long-term rates. 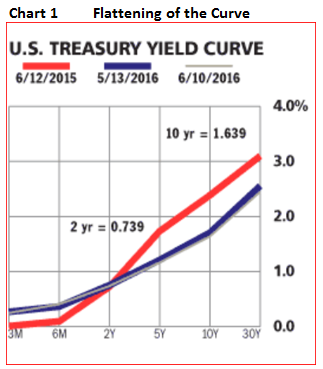 Changes in the slope of the yield curve signify changes in the economic outlook. Over the past few months, the yields on long-dated US Treasuries, 10 years and up, have fallen and, at the same time short term rates have moved up. ( see Chart 1) These two developments are related. Short rates have moved up in anticipation of the Fed increasing its overnight interest rate. Fed Chairperson, Janet Yellen, has spoken of the need to increase the policy rate in " the coming months" and other members of her committee have voiced similar views. In its most recent policy meeting, the FOMC continues to hold out the possibility for at least one or more rate increases before year's end. At the same time, investors in the long end of the bond market are saying that any short rate increases will have a detrimental effect on economic growth and that any policy shift must weigh that consideration. 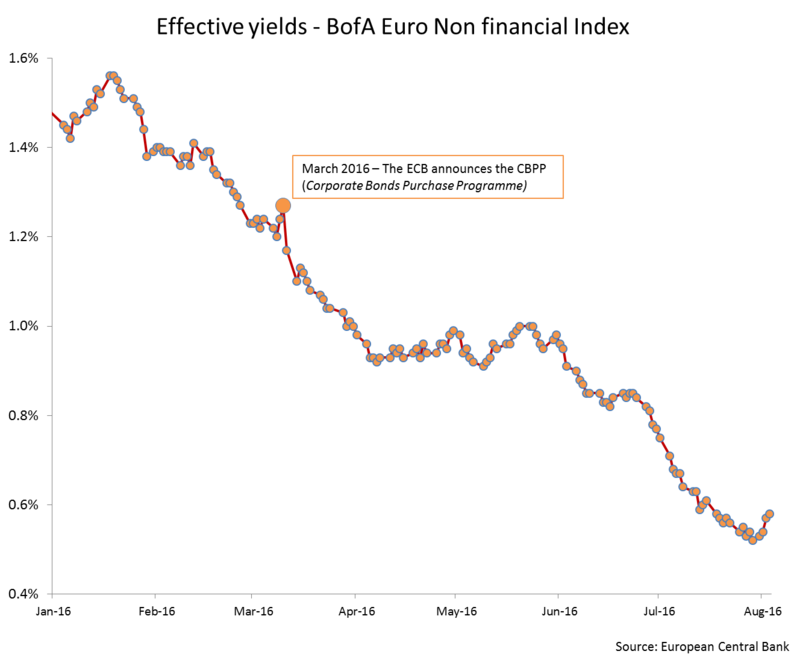 In effect, the long end of the curve is saying: increase short rates at your ( Fed`s) peril. 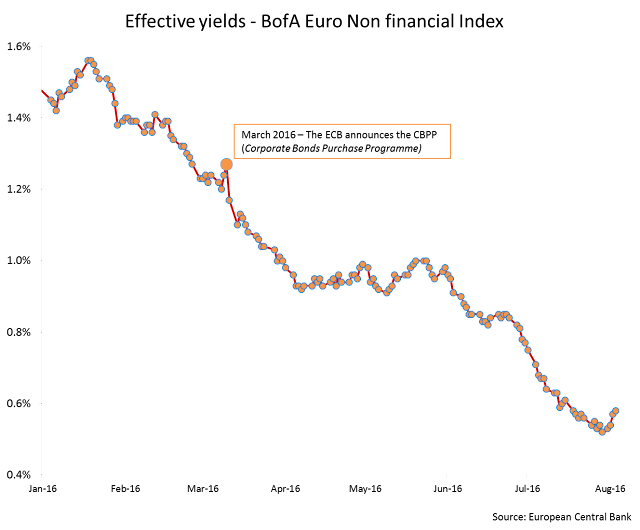 Chart 2 maps out the change in the spread between 2- 10-year yield. It has narrowed from 170 bps to 90 bps over the past year. In part, the 2-year rate moved up sharply in response to the Fed signalling that it wants the bank rate to move up this year as part of its objective to “ normalize” rates. But it is the falling long-term yields which are most disconcerting. It signifies that the investors expect future growth to be weaker and that they also expect future inflation to be lower than was previously forecasted a year earlier ( Chart 1). It is the change in expectations that we need to focus upon. Investors have also adjusted their inflation expectations. 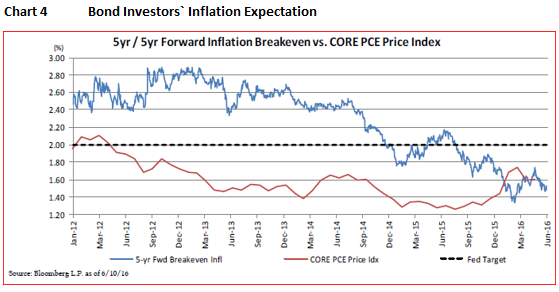 One measure of inflation expectation is the 5-year breakeven inflation rate. This is the difference between the 5-Year Treasury bond rate and the yield on an inflation-protected security with 5-years remaining to maturity ( so-called TIPS). Chart 4 shows how these expectations have dropped considerably from around 2.8 percent in 2012 to 1.6 percent today. In fact, investors have adopted a greater downward revision to their expectations than in the case of consumer groups. It is the investors who are driving the bus on the yield curve road. Other Factors Affecting Long-term Bond Yields. Ben Bernanke has maintained for some time that the global savings rate is too high and that excess savings is fuelling the demand for debt instruments, especially quality sovereign debt. There is a lot of merit in this argument when one looks at the high savings rates in the emerging markets - often in excess of 25 percent of GDP. Even in the industrialized countries savings are relatively high. Or, alternatively, consumption is too low. Either way, excess loanable funds have to be channeled into investment, and this generates a growing demand for credit instruments worldwide. Another explanation for the fall in long-term rates is related to liquidity in the international bond markets. Barry Eichengreen argues that ``international liquidity has plummeted from nearly 60 percent of global GDP in 2009 to barely 30 percent today.` The most important form of bond liquidity is the US government bonds which are held by banks, large institutions, and foreign central governments. Recent auctions for US Treasuries feature large oversubscriptions, and this has driven yields lower. There is more than just a temporary flight to safety to quality debt; there appears to be a major shift in asset preference in favour of high-quality debt issued by the US, Germany, Japan, and UK governments . To the extent that new government debt issued is immediately taken up by these institutions and are essentially held to maturity rather than traded, means that there is less liquidity in the marketplace. Scarcity will drive up bond prices. What can we learn from the recent behaviour of the yield curve? Low yields are a symptom of economic malaise . Although there have been many criticisms of central bankers for introducing negative short interest rates, the central bankers are not responsible for the decline in long-term interest rates. Negative interest rates are not the problem. Slow growth and disinflation are driving longer rates to historic low levels. These bond yields are not the problem but are the symptom of widespread economic weakness that is not expected to improve over the next decade. Low inflationary expectations are well-entrenched. Clearly, the negative nominal and real rates of interest are sending a powerful signal that those economies are going to experience very low growth without inflation for the next 5 to 10 years. There is a well-entrenched view that inflation and growth will remain very subdued over the next decade. 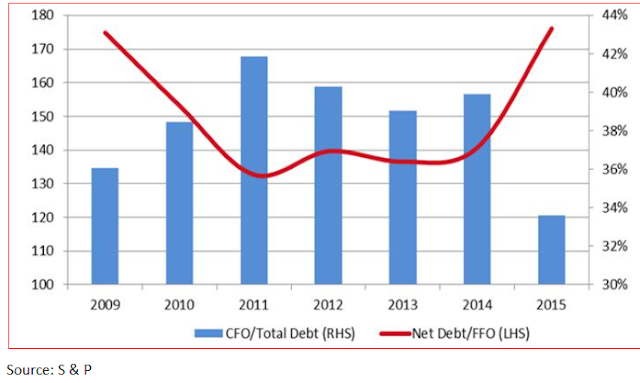 Shortage of quality debt.There is growing evidence that quality debt remains in strong demand and highly sought-after. The decline in the term premium on long-dated government bonds demanded by institutional and central bank investors supports this assertion. Long term rates to remain low. The combination of strong demand and supply restraints will keep long bond yields at these levels or even lower for many years. Any change in the current direction of bond yields will not come from within the market itself. Rather yields will rise only if governments resort to aggressive fiscal policies that promote growth and higher inflation. As yet, there is no sign of any policy shift in that direction, especially in the US and the EU.